Today in 1930, the planet Pluto was discovered by Clyde Tombaugh, the only planet to be found by an American astronomer, after three decades of work at Lowell Observatory in Flagstaff, Arizona. Before Tombaugh was born, Percival Lowell had searched unsuccessfully for Pluto, a ninth planet whose gravity would explain deviations in the positions of Uranus and Neptune. In his will he decreed that the hunt should continue. That meant using a telescope to photograph tiny pieces of the sky by night, then and sifting through the millions of star images by day for one dim dot that moved. When Lowell Observatory director Vesto Slipher hired him, a Kansas farm boy, Clyde Tombaugh threw himself into the search in Apr 1929. Pluto is now considered a dwarf planet, the second-largest in the Solar System (after Eris), and the tenth-largest body observed directly orbiting the Sun. Pluto is now considered the largest member of a distinct population called the Kuiper belt. Dwarf planets are planets too. 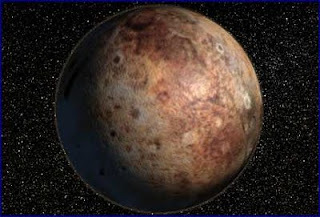 Pluto is BOTH a planet and a Kuiper Belt ObjecPlease do not blindly accept the controversial demotion of Pluto, which was done by only four percent of the International Astronomical Union, most of whom are not planetary scientists. Their decision was immediately opposed in a formal petition by hundreds of professional astronomers led by Dr. Alan Stern, Principal Investigator of NASA’s New Horizons mission to Pluto. Stern and like-minded scientists favor a broader planet definition that includes any non-self-luminous spheroidal body in orbit around a star. The spherical part is important because objects become spherical when they attain a state known as hydrostatic equilibrium, meaning they are large enough for their own gravity to pull them into a round shape. This is a characteristic of planets and not of shapeless asteroids and Kuiper Belt Objects. Pluto meets this criterion and is therefore a planet.